Shane Vande Voort | Classic Aviation, Inc.
Shane is the owner of Classic Aviation, Inc. as well as a CFII, MEI, A&P, IA, and an ATP rated pilot with type ratings for the Cessna Citation 650 series, the Bombardier Learjet 40/45 series, Embraer EMB500/EMB505 Phenom 100/300, the Hawker/Beechcraft BE400 and the Hawker/Beechcraft RA-390 Premier. Shane has continuously held a Master CFI designation since November 2006. 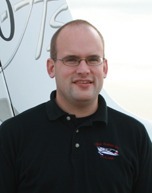 Shane also became a designated Pilot Examiner for the Des Moines FSDO in November 2008. In 2010, he was awarded the Flight Instructor of the Year and Safety Representative of the Year Awards by the Des Moines FSDO. Shane provides pilot service, flight instruction, and maintenance for Classic Aviation, Inc. He also represents the City of Pella as the Airport Manager and has been appointed as an FAA Aviation Safety Counselor. He is a member of the Cirrus Standardized Instructor Program® and serves as the chief Flight Instructor for Classic Aviation’s Cirrus Authorized Training Center®. Shane has completed numerous training courses at FAR § 142 Simulator Training Centers. Shane holds an Associate of Applied Science Degree in Aviation Maintenance Technology from Indian Hills Community College and is a long time resident of the Pella area. Shane, his wife Megan, and their two sons reside in Pella. Megan uses her interest in photography to capture the fun and excitement at Classic Aviation. Her photography, including air-to-air photos, can be seen all over the Classic Aviation website.